I can’t believe I did not yet feature this book/screenplay before. I mean, it’s only MY BIGGEST WISH EVER COME TRUE! I feel like I’ve wanted this almost my whole life. I’m so excited! And nervous! And a little scared. But mostly excited! 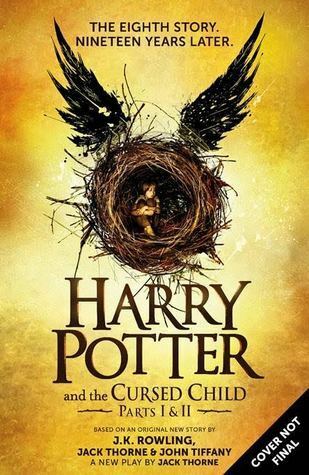 NEW HARRY POTTER, NEW HARRY POTTER, NEW HARRY POTTER! I’m anxiously anticipating this book! I can not wait to read it. I’m quite nervous too! I’m sure we won’t have anything to worry about, but I can’t help it haha! Sadly, I’m a Harry Potter Virgin. But, I have 9 months to read my son’s entire collection to get ready for Orlando and Apollycon in March! Great pick! New FB liker. My Waiting On Wednesday is here, if you’d like to stop by! Thanks! I hope you’ll enjoy the Harry Potter series! I know I would love to be able to read it again for the first time 🙂 Will definitely check out your post!